You don’t believe lauki or ghiya can be so delicious until you get a taste of these koftas. Soft and full of flavour from the creamy onion tomato masala that they have been cooked in these koftas melt in your mouth. Each of these lauki koftas is stuffed with a some dry fruits ball which adds a beautiful hint of crunchiness to it. 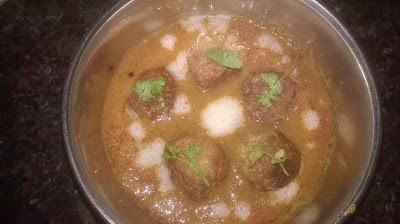 It is my favorite kofta curry to eat along with steamed rice.